Ugandan playwright and filmmaker Judith Adong. (One of this year's Prince Claus Award winners, Ugandan playwright and filmmaker Judith Adong, says she was inspired by the 1991 Zimbabwean film Consequences, directed by John Riber. "At the age of 13 after watching Consequences, I bacame obsessed with becoming a filmmaker because seeing Africans on the big screen was magical. For a long time, I had imagined being in a film was a mzungu (european) thing. Consequences let me know even I could make films, which at the time I didn't even know was called filmmaking," says Adong. Adong was awarded alongside seven cultural practitioners, a journal and an institution. The awards are organised by the Prince Claus Fund based in the Netherlands, and honour visionary individuals and organisations for groundbreaking work in fields of culture and development. Adong's work raises public debate on contentious issues to provoke positive change. Her first play, Silent Voices, reveals the terrors of Uganda's 20-year conflict with the Lord's Resistance Army and challenges of the peace-building process, asking difficult questions about amnesty and forgiveness and confronting the public's passivity and complicity. She brings the stories of vulnerable and disadvantaged people to the wider public of Uganda and the world. Her works tackle such controversial subjects as the struggle for the rights of lesbian, gay, bisexual, transsexual and intersex people in Uganda, the hypocrisy of religious and gender politics, child sacrifice practices, social media deception and the horrors of colonialism. She is the first Ugandan to receive the Prince Claus Award. 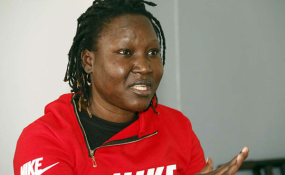 Adong says she spent a good part of her life chasing the filmmaking dream, so much so that even when she was doing so well in the theatre programme that she ended up being admitted to Makerere University, she still dreamt of being in films. This dream came true when won a Fulbright Fellowship to study at Temple University's MFA Filmmaking and Media Arts in the US. "After that I was able to make some films, and I must admit that I find the rawness of theatre unmatched. Of course one cannot ignore the fact that film has more legs to travel, making it more far-reaching than theatre, especially for the kind of stories I tell. "However, one thing that makes both film and theatre exciting for me, is simply the power of storytelling to humanise viewers. This is the heart of it for me," she adds. "When an award comes to you from an organisation you had applied to three times for production grants and only received rejections, words cannot even begin to explain how much it means. Now, they are recognising the power of the work I have done. My work has finally spoken to them and it is an exhilarating feeling. "This is a huge boost to my energy which was already getting deflated and I was wondering if anybody really cares. But someone definitely cares, no matter how far away from home they are. This award is reassuring," she further added. "In a country where art and artists are not taken seriously, it is good to receive such a powerful validation and appreciation of my artistic work. There is a misconception that artists are not smart enough to represent citizens in places like parliament," she said. Judith Adong was born in Gulu district in northern Uganda in 1977. She holds a MFA in Filmmaking and Media Arts from Temple University in the US, a Bachelor of Arts in African Language, Literature in English and Theatre, and a Diploma in Music, Dance and Drama from Makerere University, Uganda. After a day's work Adong unwinds by sipping some good wine and watching television series. She is the artistic director of Silent Voices Uganda, a non-profit organisation that supports the development and production of performing arts. According to Adong, the biggest challenge facing Uganda's film and the performing arts is the limited training that the students are receiving in relation to theory versus practices. "Theory is all good if a student aspires to become a scholar, but when a student aspires to work in the field of producing and a lot more time has to be dedicated to practical lessons. Currently, the opposite is true in Uganda, where more time is dedicated to theory," she says. Adong will receive her award later at the end of the year at a ceremony where Prince Constantijn will present the awards at the Royal Palace in Amsterdam, the Netherlands on December 6. On December 5, the 2018 Laureates will tell their stories at Louder than Words, a public event at the Compagnie theatre in Amsterdam. The other 2018 Prince Claus laureates are the Market Photo Workshop (South Africa), Marwa Al-Sabouni (Syria), Kidlat Tahimik (Philippines), Eka Kurniawan (Indonesia), O Menelick 2º Ato (Brazil).